Geomorphology and Volcanology of Costa Rica is the product of more than 30 years of research explaining the evolution of the quaternary relief of a geomorphologically diverse country. The book details the physical landscape of Costa Rica, with an emphasis on potential threats to the landscape, such as earthquakes, landslides, floods, and sea level rise. The book answers questions on the climate changes associated with the intense volcanism that affects this country. Geomorphologists, geologists, geographers, and students who specialize in the Earth Sciences will benefit from knowing the geomorphology of Costa Rica, not only as a case study, but also for the lessons it offers on climate change and worldwide geological history. 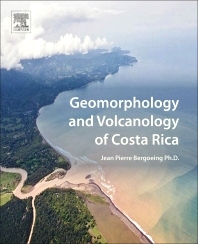 Jean Pierre Bergoeing is a French Geomorphologist and polyglot, studied at the Pontifical Catholic University of Chile. He continued his studies at the University of Aix-Marseille II, France, where he successively obtained a Master's degree in Physical Geography (1972), a 3rd cycle Doctorate in Geomorphology (1975) and finally a State Doctorate in Letters and Human Sciences (1987). His career has developed in three continents, America, Europe and Africa. He has been Professor of the Pontifical Catholic University of Chile, Nantes University of France, Abdou Moumouni University of Niamey, Niger, and the University of Costa Rica. He has also worked for the French Government as international aid worker and later served a diplomatic career as a Scientific and Technical cooperation Attaché. He is the author of several books and numerous publications in international journals, and geomorphic maps on Chile, Costa Rica, Central America, Africa and Europe – including Geomorphology of Central America (Elsevier, June 2015).